How Does a Shop & Carry® Food Wagon Work? It's a simple concept: take the traditional shopping cart, fix what's wrong, then go one better. The result is a modular wagon made of four containers that lock together. Take it to the supermarket, and it's put together almost instantly. Wheel it out of the supermarket, and everything's already in containers: no bags piling up. It can be wheeled to your car or all the way back home, then taken apart for easy storage.If you walk to your food store, you can still do so with your own Shop and Carry® food wagon. The Shop & Carry® can then be wheeled into the store to start shopping. 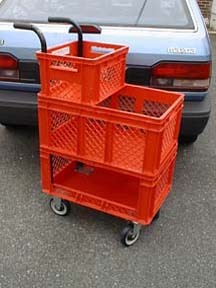 - The Shop and Carry® food wagon is a modular shopping cart that you own. - We no longer need metal wagons, paper and plastic bags. - The Shop and Carry® holds at least $200.00 in groceries with the Curved Front Container. - Assembles and comes apart in seconds! If you drive, just take apart your Shop and Carry® food wagon and place it in your car. When you arrive you will find it faster to put together your own Shop and Carry® food wagon than it is to find a metal wagon without: a wobbly wheel, sticky handle bar, an annoying squeak or one you don't have to wrestle with because it is stuck so tight in that compressed pile of wagons. Just stack three containers, insert the M locks and handle bars to start shopping with your own Shop and Carry® food wagon. The optional curve front container just hooks on to the front. The Shop and Carry® food wagon is 40 1/8" (inches) in height, approximately 15" (inches) wide and less than two feet long. An empty metal wagon will weigh as much as 50 pounds more than an empty Shop & Carry® Food Wagon fully assembled. The Shop and Carry® food wagon is made to last many years. Even during the coldest winter and hottest summer. NOTE: If you have returnable bottles and cans in your state, use your Shop and Carry® food wagon to hold and transport them back to the store for your deposit refund. NOTE: If you are doing some "light" shopping only bring the top container of your Shop and Carry® food wagon. When you are done food shopping, go to check-out, as your food is scanned you save time placing your food items back into your own Shop and Carry® food wagon. No paper bags, no plastic bags, no bags of any type are needed! Your favorite supermarket may also offer you additional savings for using your own Shop and Carry® food wagon. Any program offered to customers using a Shop & Carry® food wagon, may earn back your cost to buy your own Shop & Carry® food wagon and then some. This is just one way your supermarket can say thank you for helping to lower their operating expenses. See Supermarket Benefits' Link on the right. NOTE: Use top container for veggies and fruits to avoid using those plastic bags the supermarkets provide on rolls. They are unnecessary with your own Shop and Carry® food wagon. Besides, nobody enjoys trying to figure out which end of those plastic bags actually open! NOTE: For items like ice cream, and unpackaged goods, we have optional clear plastic containers that are reusable and can be kept in your own Shop and Carry® food wagon. NOTE: Customers who shop at supermarkets with self-scan check-outs will save time. Customers in any town or city following the recent steps taken in San Francisco, that are geared to prevent the waste of paper and plastic bags, will also be saving money. Why pay seventeen cents at check-out for the bags, when no bags are needed with your own Shop & Carry® food wagon? In addition, when RFID tags* become widely used, customers using their own Shop & Carry® food wagon will eliminate the check-out line altogether. Just go to a separate check-out, and with one wave of a receiving wand around your Shop & Carry® food wagon, all your groceries are added up. No packing necessary, just pay and go. * Radio Frequency Identification Tags have already started to replace the UPC bar codes. With the Shop & Carry® food wagon, you save time placing your groceries into your car; just three or four Shop and Carry® containers instead of eight paper bags or fourteen plastic ones. Also no more paper bags ripping or plastic bags falling over and spilling food all around the car. If you are walking back home be assured that your food doesn't get crushed like in other types of metal wagons. Carry individual containers (up to four), that can evenly distribute the weight of your groceries, into your house or up your apartment stairs. Compare up to four trips with Shop and Carry® containers with six to eight trips with bags. If your building has an elevator, just wheel your Shop and Carry® food wagon right on. Some people also use their Shop and Carry® food wagon to bring laundry to and from the apartment laundry room in the basement. When you are not using your Shop and Carry® food wagon, just condense it down to keep in a closet, hallway, car trunk or garage. We trust that we have started to earn your respect. The Shop & Carry® food wagon will make an immense difference for our environment and our children's future. For more information please review our Frequently Asked Questions page.